We describe successful immunotherapy of murine AIDS (MAIDS) in C57BL/6J mice based on the elimination of replicating CD4+ regulator T cells. We demonstrate that a single injection of the antimitotic drug vinblastine (Vb) given 14 days postinfection (p.i.) with LP-BM5 can prevent MAIDS progression. Treatment with anti-CD4 mAb at 14 days p.i. is similarly able to prevent MAIDS. Treatment at other time points with Vb or anti-CD4 mAb is ineffective. The effect is based on ablation of a replicating dominantly suppressive CD4+ T cell population, as indicated by adoptive transfer and in vivo depletion experiments using mAbs against CD4 as well as combinations of mAbs against the known regulatory cell surface markers CD25, GITR, and CTLA-4. Cell surface marker analysis shows a population of CD4+CD25+ cells arising shortly before day 14 p.i. Cytokine analyses show a peak in IL-10 production from day 12 to day 16 p.i. MAIDS-infected mice also have CD4+ T cells with significantly higher expression levels of CD38 and particularly CD69, which have been demonstrated to be regulator T cell markers in the Friend retroviral model. The immunotherapy appears to prevent disease progression, although no protection against reinfection with LP-BM5 is generated. These data define a new therapy for murine retroviral infection, which has potential for use in other diseases where T regulator cell-mediated immunosuppression plays a role in the disease process. Murine AIDS (MAIDS)2 is a severe immunodeficiency syndrome induced by the LP-BM5 murine leukemia virus (MuLV) mixture in susceptible strains of mice (1, 2). The mixture contains three MuLVs: a replication-competent ecotropic virus; a mink cell focus-inducing virus; and a replication-defective virus (designated LP-BM5def) which has been identified as the etiological agent of disease (1, 3). Sequences unique to LP-BM5def at the p15/p12 junction have been shown to be necessary and sufficient for the development of MAIDS pathology (4). The MAIDS model is considered an effective tool with which to investigate the mechanisms of retrovirus-induced immunodeficiency and has been used as a mouse model for human AIDS due to the similarity of symptoms (2, 5). Although there are similarities between MAIDS and HIV/AIDS, there are also significant differences. These include the virus itself (which is not a lentivirus), the viral pathology (B cell tropism) and notably, whereas CD4+ T cell function is progressively impaired in MAIDS, the CD4 count does not decrease as is the case in HIV/AIDS (2). Adult C57BL/6 mice inoculated with LP-BM5 develop lymphadenopathy, hypergammaglobulinemia, and chronic splenomegaly (2, 5, 6). In vitro, there is a progressive impaired responsiveness of T and B cells to mitogenic or antigenic stimuli (2). In vivo, infected mice become increasingly immunodeficient, resulting in increased susceptibility to opportunistic infection. Deaths are first observed at 8–10 wk postinfection (p.i. ), with 100% mortality by 24 wk (2). These alterations in immune function reflect complex changes in the phenotype and function of all components of the immune network. The chromosomal DNA of inbred and wild mice has been shown to contain numerous copies of MuLVs, among which are incomplete as well as complete and potentially infectious genomes (7). It is estimated that endogenous retroviral sequences (ERVs) make up at least 1% of total genomic DNA (8). ERVs may potentially affect the development and outcome of a retroviral infection (9, 10, 11). In the case of MAIDS, we hypothesize that when these ERVs are expressed during development they are recognized as self-Ags by the immune system. Due to the high level of sequence homology between endogenous and exogenous MuLVs in both nucleic and amino acid sequences (7, 12, 13), an infecting MuLV may also be recognized as self by the immune system. The mechanisms by which self/nonself discrimination is mediated in T cells belong to an area about which knowledge is growing rapidly. The mechanisms controlling self-reactive T cells can be classified into two broad groups. Mechanisms in the first group are passive given that they depend on either a functional absence of autoreactive cells (clonal deletion) or the presence of self-Ags in a nonimmunogenic form (T cell anergy). The second group is referred to as active (or dominant) because they prevent the activation of T cells that have the potential to cause autoimmunity. Active tolerance is so-called because this mechanism involves the active control of autoreactive T cells by regulatory T (Tr) cells (14). In the murine (and human) system, Tr cells are currently of considerable interest due to their apparently ubiquitous nature. There are currently three well-defined subsets of CD4+ Tr cells (CD4+CD25+, Tr1, and Th3), all of which coexpress CD25 on the cell surface and exert their function through either cell-to-cell contact or cytokine expression (15). Tr cells play important roles in autoimmunity (16, 17, 18, 19, 20, 21, 22, 23, 24, 25, 26), tumor immunity (26, 27, 28), transplantation and self tolerance (26), and infectious diseases such as hepatitis C (29) and Bordetella pertussis infection (30). Most recently, Tr cells have also been strongly implicated in regulating airway hyperreactivity in asthma (31, 32) and in the establishment of tuberculosis (33). IL-10 secretion has been shown to be the mechanism used by Tr cells in chronic hepatitis C infection (29), B. pertussis (30), asthma (31, 32), and tuberculosis (33). Additionally, immunosuppression by a CD4+-regulatory T cell has been described in the Friend retroviral model (34) as a result of chronic infection with this retrovirus. Current research is now also focusing on the cellular biology of Tr cells. This includes the involvement of Foxp3 in regulatory T cell development (35, 36) and the role of dendritic cells in the generation of regulator cells (33, 36, 37), including the role of Toll-like receptors (37). This work indicates that a CD4+-regulatory T cell subset is also important in controlling the murine immune response to LP-BM5 retroviral infection and, more importantly, that the timed ablation of these cells during their initial expansion is effective in significantly slowing disease progression. Experiments are presented that show that a narrow treatment window exists 14 days p.i. in C57BL/6 mice infected with LP-BM5. The treatment is effective only when administered during the window period and can be either a single dose of the antimitotic agent Vb or an anti-CD4 mAb. The treatment window also coincides with times of peak production of the immunoregulatory Tr cytokines IL-4 and IL-10. The extended treatment of mice with mAbs against the known Tr cell surface markers CD25, GITR, and CTLA-4 are effective in slowing disease progression when used in combination. Treated mice show no signs of disease progression up to 20 wk p.i. when controls exhibit close to 100% mortality. Successfully treated mice show no protection from a subsequent rechallenge with LP-BM5. Adoptive transfer experiments have confirmed that the day 14 p.i. treatment effect is CD4+ T cell dependent and can be transferred to naive mice. The role of regulator T cells as a therapeutic target in retroviral infection is discussed in the light of current antiretroviral therapies. Female C57BL/6J mice, 6 wk old, were purchased from the Animal Resource Centre (Murdoch University, Perth, Australia) and housed in specified pathogen free conditions (Department of Microbiology, University of Western Australia, Nedlands, Australia). LP-BM5 virus stocks were obtained from the tissue culture supernatant of SC1-G6 cells grown at 37°C and 5% CO2 in DMEM (Life Technologies, Gaithersburg, MD) supplemented with 10% FCS (Life Technologies), 2 mM l-glutamine, 60 μg/ml penicillin, and 40 μg/ml gentamicin. The collected supernatant was centrifuged at 1000 rpm for 5 min to remove cellular debris. Stocks were assayed for their ability to induce MAIDS in adult C57BL/6J mice as measured by at least a 3-fold increase in spleen weight at 10 wk p.i. Mice were inoculated with 100 μl of LP-BM5 by i.p. injection. Mice were treated with 6 mg/kg body weight of the antimitotic agent Vb (10 mg/ml; Mayne Pharmaceuticals, Melbourne, Australia) by i.p. injection. The following hybridoma cell lines were used: YTS191 anti-CD4 mAb and YTS169 anti-CD8 mAb (gift of Dr. A. Scalzo, Nedlands, University of Western Australia); PC61 anti-CD25 mAb (gift of D. Cooper, Clinical Cell Culture C3, Perth, Australia); DTA-1 anti-GITR mAb (gift of Professor S. Sakaguchi, Institute for Frontier Medical Sciences, Kyoto, Japan); and 9H10 anti-CTLA-4 (gift of Dr. J. Allison, University of California, Berkeley, CA). All mAbs were partially purified from tissue culture supernatants by ammonium sulfate precipitation, dialyzed and resuspended in PBS for use. For timed depletions, mice received a single treatment of 0.5 mg of anti-CD4 or anti-CD8 mAb by i.p. injection on the appropriate day p.i. FACS of splenocytes prepared from mice 24 h after a single injection of mAb showed a 98% reduction in CD4+ cells and a 95% reduction in CD8+ cells. For extended depletions, mice received 0.1 mg of anti-CTLA-4 mAb, 0.5 mg of anti-CD25 mAb, or 1 mg of anti-GITR either alone or in combination on days −2, 2, 6, 10, 14, and 18 p.i. by i.p. injection. Controls received 200 μl of PBS instead of Ab. Splenocyte suspensions were prepared as previously described (38). Blood lymphocytes were collected from tail vein blood into EDTA-coated tubes (Microtainer Brand; BD Biosciences, Mountain View, CA) and centrifuged at 8000 rpm for 10 min to collect serum. Cell pellets were resuspended in equal volumes of 3 mM EDTA and 2% Dextran T-500 and incubated at 37°C for 15 min to sediment RBC. White blood cells (WBCs) were collected by centrifugation and resuspended in PBS containing 5% FCS and 5 mM NaN3. Cell suspensions were incubated with combinations of anti-CD4-allophycocyanin, anti-CD8-PE, anti-CD25-FITC, anti-69-PE, anti-CD38-biotin, anti-B220-FITC, and anti-CTLA-4-PE mAbs (all BD PharMingen) for 20 min at 4°C, washed twice, and, if stained for CD38 cells, resuspended in Quantum Red (Sigma-Aldrich, St. Louis, MO) for 30 min at 4°C, washed twice, and then resuspended in PBS, 5% FCS, 5 mM NaN3 for acquisition. Cell populations were acquired on a FACSCalibur (BD Biosciences) and analyzed using CellQuest (BD Biosciences) software. Single-cell suspensions of splenocytes were prepared, from day 15 p.i. donor mice and resuspended in 150 μl of PBS for injection into recipient mice. Recipient mice received 1.6 × 108 cells via tail vein injection on day 15 p.i. For the experiments requiring removal of CD4+ cells before adoptive transfer, splenocyte suspensions from donor mice (day 15 p.i.) were prepared, stained with anti-CD4-allophycocyanin, and sorted using a FACSVantage (BD Biosciences). The CD4-depleted fraction (∼99.5% pure) was pelleted at 1000 rpm for 5 min and resuspended in PBS. Recipient mice received 8 × 106 CD4-depleted splenocytes in a 100 μl of volume of PBS via tail vein injection. Samples of spleens from different experimental groups were fixed in 10% formalin, embedded at 60°C in paraffin wax, and sectioned (5 μm) using standard procedures. Sections were transferred to slides and stained with H&E for light microscopy examination. For direct ex vivo intracellular analysis of cytokine production, splenocytes were prepared as single-cell suspensions, incubated for 20 min at 4°C in CytofixCytoperm solution (BD PharMingen), and stained with anti-IL-4-PE-, anti-IL-10-PE-, and PE-conjugated isotype control mAbs. ELISPOT of the production of IL-4 and IL-10 by splenocytes was conducted using commercially available ELISPOT kits (R&D Systems, Minneapolis, MN) without restimulation. Blood samples were collected from tail vein blood into EDTA-coated tubes (Microtainer Brand) and centrifuged at 8000 rpm for 10 min to collect plasma. Total RNA was then extracted using the QIAamp Viral RNA Mini Kit (Qiagen, Chatsworth, CA) with an on-column RNase-free DNase step added. For standardization, each sample had the same volume of plasma extracted and then eluted in the same volume in the final step of the extraction. A one-step real time RT-PCR was then performed by amplifying 5 μl of samples using the QuantiTect SYBR Green RT-PCR kit (Qiagen) on a GeneAmp 5700 Sequence Detector Thermocycler. The primers used are designed by Ogata et al. (39) in 1993. Amplification conditions were 50°C for 30 min and 95°C for 15 min followed by 40 cycles of 95°C for 30 s, 58°C for 30 s, and 72°C for 1 min. After amplification, a melting program was run to check for the amplification of specific product. The amount of viral RNA in each sample was quantitated against a standard curve constructed using RNA transcripts of LP-BM5def. The transcripts were made by subcloning the LP-BM5def genome from the JP1 plasmid (4) into the pGEM vector and linearization with BamHI; the transcripts were then produced using the Riboprobe System-T7 system (Promega, Madison, WI). Statistical analysis was conducted using Student’s t test, assuming unequal variance of the means of the populations being examined, and all values cited are two-tailed at a 95% confidence interval. Where multiple comparisons were made, Dunnett’s t test was used at both 95 and 99% confidence intervals. IL-4, IL-10, and TGF-β are important for Tr cell induction, maintenance, and signaling (15, 40). The presence of both IL-4 and IL-10 in spleen cells, immediately ex vivo from LP-BM5-infected mice, was measured using intracellular flow cytometry (Fig. 1⇓A). The cytokine secretion from these same cells was also measured by ELISPOT (Fig. 1⇓B). For both assays, cells were not stimulated after collection, so that any results seen would reflect the effect of LP-BM5 on the spleen cells of the infected animals. Selected time points from day 0 to day 20 p.i. were assayed using both techniques. The results show that there are significant peaks in the production of IL-4 and particularly IL-10 production at day 16 p.i. In particular, ELISPOT (Fig. 1⇓B) shows a significantly higher number of cells secreting IL-10 as opposed to IL-4, a profile that is consistent with the cytokine secretion profile of Tr cells (15). Ex vivo cytokine production by splenocytes during MAIDS infection. Intracellular flow cytometry (A) and ELISPOT (B) for IL-10 (▪) and IL-4 (▴) were conducted on the same mice. Briefly, groups of mice were infected with LP-BM5, and spleens were collected on days 4, 8, 12, 16, and 20 p.i. Single-cell suspensions of splenocytes were prepared and used in the assays without further in vitro stimulation. Uninfected mice were used for the day 0 time point. Data are the mean ± SEM of three mice per time point. Because all of the currently defined CD4+ Tr cells coexpress CD25, a time course examining the in vivo changes in the percentage of CD4+CD25+ cells in the blood of LP-BM5-infected mice in the first 3 weeks p.i. was conducted using flow cytometry. The results of three independent experiments, shown combined in Fig. 2⇓, indicate that there is a statistically significant peak in the percentage of CD25+CD4 T cells at day 12 p.i., followed by a decrease at day 13 p.i. The peak in CD4+CD25+ percentage seen in Fig. 2⇓ occurred on days 10–12 p.i., corresponding with the beginning of the IL-10 and IL-4 peaks. Indeed, the peak of CD25 coexpression on CD4+ T cells was seen at day 12 in two of the experiments and at day 11 p.i. in the third, showing some variability in the individual mouse responses. Taken together, temporal expression of cell surface markers (CD4+CD25+) and the direct ex vivo cellular data (IL-4 and IL-10) are highly suggestive of a small regulator cell population expanding and becoming functional (with the loss of CD25) at an early stage of MAIDS infection. In vivo profile of CD4+CD25+ cells from day 0 to day 21 p.i. Briefly, groups of mice were infected with LP-BM5, and blood collected. WBCs were collected, stained for CD4 and CD25, and analyzed by flow cytometry. Data are the percentage of CD4+ T cells that coexpress CD25. Values are the combined results of three independent experiments, n = 9 mice per time point. Statistical analysis using Dunnett’s t test shows that the increase in the percentage of CD4+CD25+ cells at day 12 is significantly different from the day 0 (baseline) at the 99% confidence level. In addition to the investigation of expansion of CD4+CD25+ cells after infection with LP-BM5, we examined the expression of CD38 and CD69 by CD4+ T cells after infection with LP-BM5. It has been reported that there is a significant increase in the level of expression of these markers on the CD4+ T cells of mice chronically infected with the related retrovirus, Friend MuLV (34). Coexpression of CD4 and CD69 was used to purify a population of Tr cells that had immunosuppressive functions. Because these viruses are closely related, it was of interest to determine whether the same changes could be observed in the MAIDS model. The results of flow cytometric analysis of these markers in the spleens of uninfected and 10 wk p.i. mice are shown in Table I⇓, which shows a significant increase in the CD4+ subsets expressing CD69 and CD38 after LP-BM5 infection, very similar in magnitude to that observed in the Friend virus model (34). Therapeutic effects of a single dose of Vb administered at different times p.i. To further examine the hypothesis that a population of regulatory T cells arises and expands in response to LP-BM5 infection, we designed an experiment to test the effect of removing these cells during infection. Given that we propose that these cells are an expanding population, they can be targeted using an antimitotic agent. Loss of such a dominant regulatory population would remove the down-regulation of the virus-induced immune effector cells, resulting in a delay in disease development. This approach has previously been used by North and Awwad (41) to determine by Vb administration when a regulator cell population was acting in a murine leukemia model. Vb is an antimitotic agent that targets actively proliferating cells; thus, a single dose of Vb given at a particular day p.i. will pinpoint whether such a population exists, because its elimination will result in measurably slower disease progression. For this experiment, groups of mice were infected with LP-BM5 and subsequently treated with a single dose (6 mg/kg i.p.) of Vb. This single dose of Vb was given at various times from 1 to 28 days post-LP-BM5 infection. Spleen weight at 10 wk p.i. is considered a reliable indicator of MAIDS progression (2), and Fig. 3⇓ shows the results of this experiment as spleen weights. Treatment with Vb was remarkably therapeutic when administered at 14 days p.i. with mice in this group showing no significant increase in spleen weight at 10 wk p.i. when compared with uninfected controls. 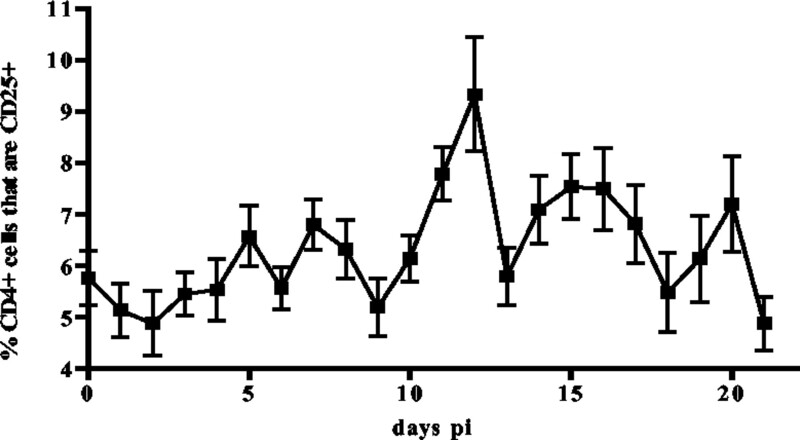 The reduction in spleen weight in mice treated at 14 days p.i. was highly significant compared with untreated LP-BM5-infected controls. In contrast, the same single Vb administration at all other time points p.i. results in either some (6 and 16 days p.i.) or no protection (all other time points examined) from MAIDS development at 10 wk p.i. as measured by spleen weight. This experiment provides evidence that there is a cycling population of cells at this time point which is involved in MAIDS development and that the removal of these cells results in the prevention of splenomegaly. Mice treated at day 14 p.i. with Vb were further examined for other indicators of disease progression. Effect of a single dose of Vb on MAIDS progression. LP-BM5-infected mice were treated with a single dose of Vb (6 mg/kg i.p.) at various days p.i. Data are from three independent experiments. The time points examined are as follows: □, uninfected control (uc, n = 13); ▪, virus-infected control (vc, n = 38); ▨, treatment at 1 day (n = 5), 2 days (n = 9), 4 days (n = 4), 6 days (n = 10), 8 days (n = 9), 10 days (n = 4), 12 days (n = 5), 14 days (n = 27), 16 days (n = 5), 21 days (n = 5), and 28 days (n = 5). Mice were assessed for MAIDS development by spleen weight at 10 wk p.i. For each experimental group, values are mean ± SEM. The day 3 and 5 p.i. time points were also tested, and no protection against MAIDS development was observed (data not shown). Statistical analysis using Dunnett’s t test for multiple comparisons showed a highly significant reduction (∗) in the mean spleen weight of the day 14 p.i. treatment group at the 99% confidence level when compared with the MAIDS controls. Histological examination showed the splenic architecture of all MAIDS-infected mice to be profoundly disorganized as has been previously reported (42). In contrast, the splenic architecture of the day 14 p.i. Vb-treated mice was indistinguishable from that of uninfected control mice at 10 wk p.i. (Fig. 4⇓). To further support the histological data and the normal spleen weights seen in these mice, FACS analysis of splenocytes was also conducted. The LP-BM5-infected mice showed a significant reduction in the percentage CD8+ T cells (15.82 ± 2.16%–7.28 ± 0.56%; p = 0.01) and a significant increase in the percentage of B cell (52.55 ± 6.07%–63.08 ± 1.56%; p = 0.002) which is consistent with previous studies of immune cell changes in the spleen during MAIDS (2, 43, 44). In contrast, the cell subset percentages in Vb-treated mice showed no difference compared with control mice (CD4+ cells: 25.76 ± 3.16%–19.47 ± 0.75%; p = 0.1008; B cells: 52.55 ± 6.07%–54.61 ± 1.83%; p = 0.7564). Furthermore, normal mice treated with Vb and examined 10 wk later showed no change in the spleen weight or in the subset composition of splenocytes compared with untreated normal mice. In addition, the LP-BM5-infected day 14 p.i. Vb-treated mice had normal serum IgG2a levels, not the hypergammaglobulinemia that is normally observed in LP-BM5-infected mice at 10 wk p.i. (data not shown). All of these assays indicate that the day 14 p.i. Vb-treated mice were protected from MAIDS development. The four parameters of MAIDS progression examined (spleen weight, spleen histology, splenocyte percentages, and serum IgG2a) were negative. Effect of day 14 p.i. Vb treatment on the development of MAIDS as determined by histopathological examination. Spleens were removed from age-matched uninfected control mice (A), LP-BM5-infected mice (B), and LP-BM5-infected, Vb-treated mice (C) at 10 wk p.i. and examined by light microscopy (A–C, ×25). Areas of white pulp (WP) and red pulp (R) are indicated. One possible explanation for the lack of disease progression is that the day 14 p.i. Vb treatment has a direct chemotherapeutic effect on the viral load. To determine whether this was indeed the case, two groups of mice were infected with LP-BM5 (n = 4 per group), one group received day 14 Vb treatment, and blood was collected from all mice at 4 and 10 wk p.i. to determine the effect, if any, of Vb treatment on the viral load. Blood from uninfected mice was used as a negative control. The uninfected mice had a viral load below the limit of detection of the assay (7.9 × 10−18 ± 1.74 × 10−18 g/μl LP-BM5def), whereas the infected mice (no Vb treatment group) had much higher viral loads at both 4 wk (5.47 × 10−16 ± 2.2 × 10−16 g/μl) and 10 wk p.i. (5.04 × 10−15 ± 1.05 × 10−15 g/μl). 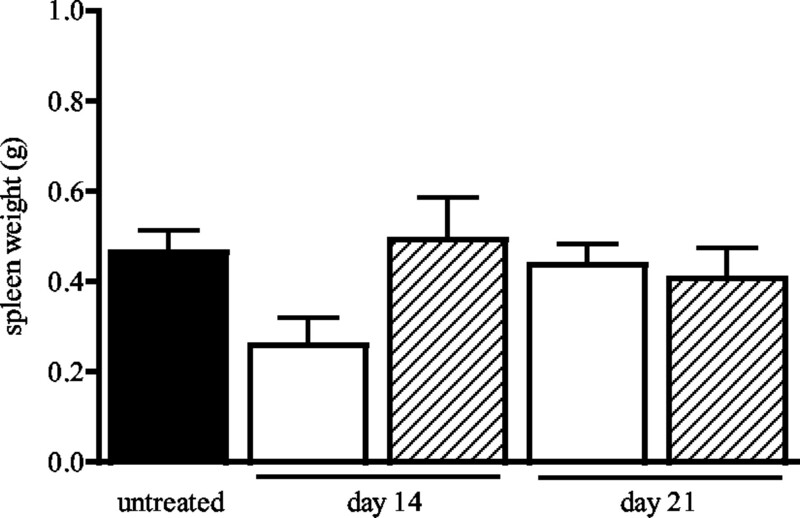 The infected mice receiving day 14 Vb treatment showed no significant decrease in viral load compared with the infected controls at either 4 wk (2.68 × 10−16 ± 1.1 × 10−16 g/μl) or 10 wk p.i. (6.42 × 10−15 ± 1.36 × 10−15 g/μl). As a further test of lack of MAIDS progression, day 14 p.i. Vb-treated mice were maintained for 20 wk p.i. MAIDS is fatal in 100% of mice at 24 wk p.i. (2); therefore, survival to 20 wk is perhaps the most reliable marker of nonprogression in LP-BM5-infected mice. Mice were treated with Vb at day 14 p.i., and spleen weights were determined at 10 and 20 wk p.i. The results of this experiment (Fig. 5⇓) showed that mice had not developed splenomegaly at both 10 and 20 wk p.i. with no significant difference between uninfected control spleen weights and spleen weights of infected day 14 p.i. Vb-treated mice. The disease progression in control mice seen in the increase in spleen weight from an average of 0.46–0.8 g is expected, whereas the slight increase in the average spleen weight of Vb-treated mice (0.2–0.26 g) is minor and not statistically significant. Protection from MAIDS at 20 wk p.i. following day 14 p.i. Vb therapy. Mice were infected with LP-BM5 and treated on day 14 p.i. (▨) with a single dose of Vb following the standard treatment protocol. MAIDS controls (▪) and uninfected controls (□) were also included in the experiment. Mice were euthanized at 10 or 20 wk p.i. and assessed for MAIDS development by spleen weight. The 20 wk p.i. MAIDS control mice were euthanized at a humane endpoint, when the enlargement of the spleen and lymph nodes began to cause visible signs of distress in the mice. For each experimental group, values are the mean ± SEM, in which each group contains a minimum of five individual mice. Statistical analysis shows that there is no significant difference in the mean spleen weight between the uninfected control group and mice receiving day 14 p.i. Vb treatment when examined at 10 wk p.i. (p = 0.155) or at 20 wk p.i. (p = 0.458). This long term protection raised the question of whether or not the protected mice could withstand a second infection with LP-BM5. Groups of mice infected with LP-BM5 were treated with Vb at day 14 p.i. and then rechallenged with a second inoculation of LP-BM5 at 3 or 8 wk post-Vb treatment. These times were chosen as being sufficient for protective immunological memory to develop after treatment. If protective immune memory to LP-BM5 had developed, the rechallenged mice would be able to respond effectively to the viral infection, and splenomegaly would not develop. However, the mice were not protected from viral rechallenge (Fig. 6⇓), with spleens significantly enlarged compared with uninfected controls. In fact, there was no significant difference between the 20 wk p.i. MAIDS controls and either of the rechallenged groups, indicating that a protective immunological memory does not develop after day 14 p.i. Vb treatment. Rechallenge with LP-BM5 virus after protective Vb therapy. Mice were infected with LP-BM5 and treated at day (d) 14 p.i. with the standard Vb treatment protocol (▨). One group of mice was rechallenged with a injection of LP-BM5 at 3 wk (w) posttreatment, the other at 8 wk posttreatment. Controls were not reinfected with LP-BM5 (▪); uninfected controls received no treatment (□). Mice were allowed to progress to 20 wk p.i. and euthanized to assess for MAIDS development by spleen weight. The 20 wk p.i. MAIDS control mice were euthanized at a humane endpoint, when the enlargement of the spleen and lymph nodes began to cause visible signs of distress in the mice. For each experimental group, the values are the mean ± SEM, in which each group contains a minimum of five individual mice. The analysis shows no significant difference in the mean spleen weights of the uninfected control group and the day 14 p.i. Vb-treated group at 20 wk p.i. (p = 0.458). There was also no significant difference between the mean spleen weight of MAIDS control group at 20 wk p.i. and that of the mice rechallenged with LP-BM5 at either 3 wk post-Vb (p = 0.759) or 8 wk post-Vb (p = 0.300). Vb treatment targets cycling CD4+ T cells at day 14 p.i. Published data from other models, specifically the Friend virus model, have shown that the Tr cells involved in immunosuppression in these models are CD4+ T cells (15, 34). To delineate the subset of immune cells mediating the day 14 p.i. Vb treatment effect on LP-BM5-infected mice, adoptive transfer experiments were designed as follows. Recipient mice were infected with LP-BM5 and treated with a single dose of Vb at day 14 p.i. The next day (day 15 p.i. ), the mice were divided into three treatment groups and received an i.v. adoptive transfer of splenocytes from one of three groups of donor mice: one group received splenocytes from LP-BM5-infected donors at day 15 p.i. that had received no further treatment; the second group received splenocytes from LP-BM5-infected donors at day 15 p.i. that had received a single dose of Vb at day 14 p.i. ; and the third group received cells from LP-BM5-infected donors at day 15 p.i. that had been depleted of CD4+ cells by flow cytometric sorting before transfer. The groups of recipient mice were then allowed to progress to 10 wk p.i., at which time MAIDS development was assessed by spleen weight. It has previously been reported that it is possible to transfer MAIDS to uninfected recipients using as few as 1–2 × 106 CD4+ T cells (45), and another study reported that 1 × 106 enriched T or B cells was sufficient to transfer disease (46), indicating that the number of cells transferred in this study (at least 8 × 106) should be sufficient to transfer disease. The results (Fig. 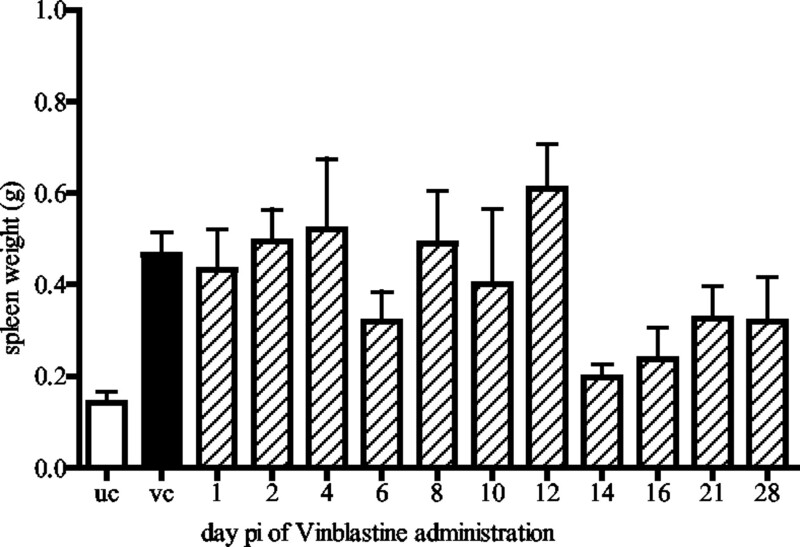 7⇓) show that Vb-treated mice, when infused with LP-BM5 but otherwise untreated day 15 p.i. splenocytes, did indeed develop a MAIDS pathology (advanced splenomegaly), indicating that the protective effect of day 14 p.i. Vb therapy had been negated by the adoptive transfer. Those mice receiving splenocytes from infected donors that had also received Vb treatment on day 14 p.i. did not develop splenomegaly at 10 wk p.i. The group of recipients that received a CD4+-depleted splenocyte transfer from LP-BM5-infected untreated donors also displayed no splenomegaly. This result shows that day 14 p.i. Vb treatment targets a cycling CD4+ T cell population that is vital for the progression of MAIDS. Adoptive transfer of splenocytes from LP-BM5-infected donors to day 14 p.i. Vb-treated recipients. Briefly, donor and recipient mice were infected with LP-BM5, and on day 14 p.i. all recipients and one group of donor mice were treated with Vb following our standard protocol. Donor mice were euthanized on day 15 p.i., and splenocytes were prepared for transfer to the Vb-treated recipients. One group received splenocytes from untreated LP-BM5-infected donors (▥), a second group received splenocytes from LP-BM5-infected, day 14 p.i. Vb-treated donors (▨), and the third received splenocytes depleted of CD4+ cells from untreated LP-BM5-infected donors (▤). Mice were assessed for MAIDS development by spleen weight at 10 wk p.i. Values are the mean ± SEM, in which each group contains a minimum of six individual mice. Analysis shows that there is no significant difference in mean spleen weight of the MAIDS control group and the mice receiving untreated donor cells (p = 0.161). The mice receiving Vb-treated or CD4+-depleted donor cells were significantly different to the MAIDS controls (p = 0.00011 and p = 0.00006) but not significantly different to uninfected controls (p = 0.916 and p = 0.674). The targeting of a population of CD4+ T cells by Vb treatment at day 14 p.i. implicates CD4+ T cells as being involved in an event that is critical for subsequent MAIDS development precisely at day 14 p.i. Although CD4+ T cells have been previously been shown to be critical for MAIDS progression (47) the finding that a specific involvement of CD4+ T cells at or on day 14 p.i. is essential for disease progression can be seen as further evidence of a CD4+ Tr population. To confirm the adoptive transfer results, we proposed that a single timed injection of anti-CD4 mAb should have the same effect in delaying disease progression as Vb treatment. MAIDS-infected mice were treated with a single injection of anti-CD4 mAb on day 14 p.i. and assessed for splenomegaly at 10 wk p.i. Control mice were treated with an anti-CD8 mAb. Fig. 8⇓ shows that in vivo depletion of CD4+ cells on day 14 p.i. resulted in a significant reduction in spleen weight compared with untreated LP-BM5-infected control mice. In contrast, in vivo depletion of CD8+ cells at day 14 p.i. had no significant effect on disease progression. In an independent experiment, the day 14 p.i. anti-CD4 mAb treatment was directly compared with the same treatment given on day 21 p.i. The results of this experiment (Fig. 9⇓) show that the anti-CD4 mAb treatment prevents splenomegaly at 10 wk p.i. when administered on day 14 p.i. but has no effect of disease progression when administered on day 21 p.i. Treatment with anti-CD4 mAb is mimicking the protective effect of Vb when given on day 14 p.i. In vivo depletion of CD4+ cells at day 14 p.i. significantly slows the progression of MAIDS. Mice were infected with LP-BM5 and on day 14 p.i. were treated with 0.5 mg of either anti-CD4 (▨) or anti-CD8 (▧) mAb i.p. Mice were then allowed to progress to 10 wk p.i. before MAIDS development was assessed by spleen weight. For each experimental group, values are the mean ± SEM, in which each group contains a minimum of 12 individual mice. Statistical analysis shows that there is no significant difference in the mean spleen weight of the anti-CD8 treatment group when compared with the MAIDS control (▪) (p = 0.644). The anti-CD4-treatment group showed a significant difference in mean spleen weight compared with the MAIDS control group (p = 0.0007) and the uninfected control group (□) (p = 0.0362). The protective effect of in vivo CD4 depletion is time dependent. Mice were infected with LP-BM5 and treated with 0.5 mg of either anti-CD4 (□) or anti-CD8 (▨) mAb by i.p. injection on day 14 or 21 p.i. ; controls remained untreated (▪). MAIDS development was assessed at 10 wk p.i. by spleen weight. For each experimental group, values are the mean ± SEM, in which each group contains five individual mice. Statistical analysis found that there was a significant difference in mean spleen weight in the day 14 p.i. 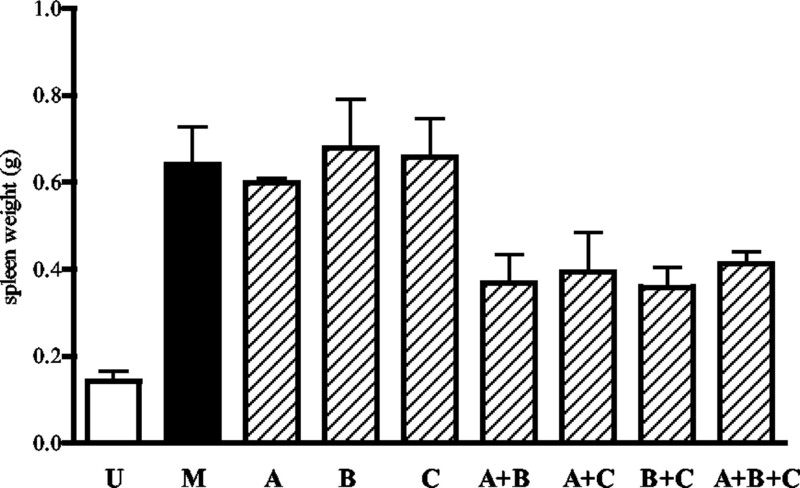 CD4-depleted mice compared with the untreated control (p = 0.0245). The mean spleen weights of the day 21 p.i. CD4-depleted (p = 0.683), day 14 p.i. CD8-depleted (p = 0.794) and day 21 p.i. CD8-depleted (p = 0.504) mice were not significantly different from that of the untreated control group. The ability of day 14 Vb and anti-CD4 mAb treatments to slow MAIDS progression suggested that treatments targeting known Tr cell surface markers may also be used to slow MAIDS progression. We therefore devised an experiment in which mice received extended treatment with mAbs against CD25, CTLA-4, and GITR either singly or in pairwise combinations every fourth day beginning at 2 days preinfection and continuing to 18 days p.i. All three Abs are blocking rather than depleting Abs, and analysis of peripheral blood by flow cytometry showed no change in the lymphocyte profile. The mice were then allowed to progress to 10 wk p.i., and disease progression was assessed by spleen weight. The results (Fig. 10⇓) show that whereas extended treatment with a single mAb has no effect on disease progression, treatment with any two mAbs in combination appeared to have a synergistic effect, resulting in a significant slowing of disease progression when compared with results in control mice. This effect was not increased when mice received treatment with mAbs against all three cell surface markers. These results again suggest that a Tr population is involved in MAIDS progression. Extended treatment with mAbs against regulator cell markers slows MAIDS progression. Mice received injections of single or combinations of mAbs. MAIDS development was assessed at 10 wk p.i. by spleen weight. For the experimental groups, values are the mean ± SEM, in which n = 6 for the MAIDS control group (M ▪), n = 3 mice per treatment group (▨) (A, anti-CD25; B, anti-GITR; C, anti-CTLA-4 mAb). An uninfected control group has also been included (□, n = 13). Statistical analysis shows that there is no change in spleen weight in the groups of mice receiving treatment with single mAbs. Those groups receiving treatment with two mAbs showed a significant decrease in spleen weight (anti-CD25 and anti-GITR, p = 0.04; anti-GITR and anti-CTLA-4, p = 0.024). The reduction in spleen weight observed in the group receiving anti-CD25 and anti-CTLA-4 was not statistically significant. The group receiving treatment with all three mAbs also showed a statistically significant reduction in spleen weight compared with the MAIDS controls (p = 0.046). Regulatory T cells have recently been implicated in several infectious diseases including hepatitis C (29), B. pertussis (30), and tuberculosis (33). A population of Tr cells have also been shown to be induced in the Friend retroviral model (34). In MAIDS, we now report the presence of a population of Tr cells induced by LP-BM5 infection that is important in controlling the host immune response to this retrovirus. Analysis of the known Tr cell surface marker CD25 shows a peak in expression levels on CD4+ T cells at day 12 p.i. The subsequent loss of CD25 expression is consistent with the presence of a CD4+ Tr cell population that loses surface expression of CD25 after maturation while maintaining function, as has previously been found in a study conducted by Gavin et al. (40). We also report a significant increase in the percentage of CD4+ T cells coexpressing CD69, a finding consistent with the CD4+ Tr population that has been described in the Friend retroviral model (34). Measurement of cytokines in spleen cells by intracellular flow showed a peak in IL-4 and IL-10 production at day 16 p.i. Although there is also some minor IL-4 production at day 16 p.i. by ELISPOT, it is notable that the peak in IL-10 secretion involves ∼10-fold more cells producing IL-10 than those producing IL-4. One of the best means of currently identifying Tr cells is by their cytokine secretion profile: high IL-10 (and/or TGF-β) with low IL-4 (K. Mills, Trinity College, Dublin, Eire, unpublished observation). The profile of the cells seen in the ELISPOT assay is indicative of a Tr population being present and active during MAIDS development. This study was then extended by conducting a time course of primary infection revealing a window of therapeutic opportunity for Tr ablation at day 14 p.i. with either Vb or anti-CD4 mAb. Both treatments result in apparently disease-free mice at 10 and 20 wk p.i. as measured by several criteria (normal spleen weight and histology, lack of elevated serum IgG2a and normal splenic WBC percentages). The treatment window also coincides with the time of peak production of the Tr cytokine IL-10. That a single dose of Vb or the anti-CD4 mAb is so effective at preventing the development of MAIDS, when administered at 14 days post-LP-BM5 infection, is remarkable given that the retroviral infection is well established and early disease processes are under way by this time in the infection (2). The apparent disease-free status of treated mice at 10 and 20 wk p.i. suggests the immune system has effectively dealt with or severely slowed the retroviral infection. If the treatments are given at times other than day 14 p.i., there is very little or no effect on the rate of MAIDS progression, indicating that a cell population crucial in the pathogenesis of MAIDS is being targeted at 14 days p.i. Alternative hypotheses to explain the empirical data such as direct effects on the cells in which the virus replicates are difficult to sustain because prevention of MAIDS development occurs only if the treatments are administered on day 14 p.i. In addition, real time RT-PCR data indicate that the protective effect observed after day 14 p.i. Vb treatment is not due to a reduction in the viral load, ruling out a direct chemotherapeutic effect on the virus itself. If Vb/anti-CD4 mAb treatments were merely removing a sufficient number of cells to halt disease progression, then treatment at other time points tested, particularly early ones, should have been effective. Adoptive transfer studies show that after day 14 Vb treatment mice receiving a transfusion of MAIDS-infected splenocytes depleted of CD4+ cells did not go on to develop disease, unlike those mice that received unfractionated MAIDS-infected cells. Mice treated with anti-CD8 mAb developed disease, confirming the critical role of a population of CD4+ T cells at this point in infection. In vivo treatment targeting the known regulator cell surface markers CD25 (21), CTLA-4 (48), and GITR (49) resulted in a significant slowing or delay of disease progression when mice received extended treatment with combinations of mAbs against these markers. CTLA-4 blockade using CTLA-4Ig has been shown previously to result in delayed disease development in MAIDS; however, this was shown to be due to blockade of CD28 signaling (50, 51), possibly explaining why anti-CTLA-4 mAb alone did not effect disease progression. Yet synergy between anti-CD25 and anti-CTLA-4 mAbs has previously been shown to be effective in antitumor therapy (27). Stimulation of GITR using the DTA-1 mAb has been shown to abrogate CD4+CD25+ Tr cell-mediated suppression (49). It is possible that these treatments are targeting alternative pathways for the suppression of effector cells, and although targeting one particular molecule has insufficient effect, treatment targeting two or more of these markers has a synergistic effect that markedly slows disease progression. These results indicate that these known regulator cell markers (and therefore regulator cells) play a role in the early stages of MAIDS development. When taken together, the data on cytokine production, cell surface marker, and the efficacy of treatments targeting both CD4+ T cells and known regulator cell surface markers indicate that there is a regulator cell population active, and essential, in the early stages of LP-BM5 infection. Treatments ablating these cells result in significant delays in or apparent lack of disease progression. Our work shows that a CD4+ subset of cells is also involved in down-regulating the immune response to LP-BM5 infection in mice. Studies are currently under way to further characterize these cells both phenotypically and functionally and to determine whether they belong to one of the currently classified Tr subsets. It has already been demonstrated that virus-induced immunosuppression by CD4+ Tr cells occurs in the Friend retroviral model (34). Murine AIDS is the second murine retroviral infection, as well as being one of a number of infectious disease models, in which Tr cells have been demonstrated. Indeed, it is tempting to speculate that the unique p15/p12 sequences of the LP-BM5def (for which no function has been designated) may function as a Tr cell inducer (4). However, this is the first infectious disease model in which deliberate targeting of Tr cells (using Vb or anti-CD4 mAb) has been shown to be therapeutic, resulting in a highly significant slowing of disease progression. The data presented in this report and much of the emerging knowledge of Tr cells require further detailed examination. If such Tr cells are a common feature of all mammalian immune responses, they offer a remarkable opportunity for immunotherapy. Strategies based on modulating the activity of Tr cells might therefore be incorporated into improved prophylactic and therapeutic interventions. ↵2 Abbreviations used in this paper: MAIDS, murine AIDS; MuLV, murine leukemia virus; ERV, endogenous retroviral sequence; Tr, regulatory T; WBC, white blood cell; p.i., postinfection. Aziz, D. C., Z. Hanna, P. Jolicoeur. 1989. Severe immunodeficiency disease induced by a defective murine leukaemia virus. Nature 338:505. Morse, H. C. D., S. K. Chattopadhyay, M. Makino, T. N. Fredrickson, A. W. Hugin, J. W. Hartley. 1992. 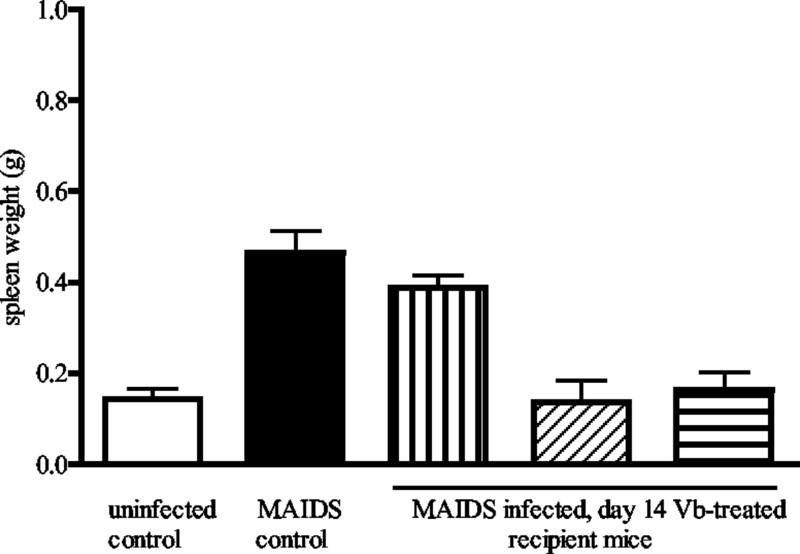 Retrovirus-induced immunodeficiency in the mouse: MAIDS as a model for AIDS. AIDS 6:607. Chattopadhyay, S. K., H. C. d. Morse, M. Makino, S. K. Ruscetti, J. W. Hartley. 1989. Defective virus is associated with induction of murine retrovirus-induced immunodeficiency syndrome. Proc. Natl. Acad. Sci. USA 86:3862. Pozsgay, J. M., M. W. Beilharz, B. D. Wines, A. D. Hess, P. M. Pitha. 1993. The MA (p15) and p12 regions of the gag gene are sufficient for the pathogenicity of the murine AIDS virus. J. Virol. 67:5989. Jolicoeur, P.. 1991. Murine acquired immunodeficiency syndrome (MAIDS): an animal model to study the AIDS pathogenesis. FASEB J. 5:2398. Mosier, D. E., R. A. Yetter, H. C. d. Morse. 1985. Retroviral induction of acute lymphoproliferative disease and profound immunosuppression in adult C57BL/6 mice. J. Exp. Med. 161:766. Chattopadhyay, S. K., M. R. Lander, E. Rands, D. R. Lowy. 1980. Structure of endogenous murine leukemia virus DNA in mouse genomes. Proc. Natl. Acad. Sci. USA 77:5774. Walchner, M., C. Leib-Mosch, G. Messer, H. Germaier, G. Plewig, P. Kind. 1997. Endogenous retroviral sequences in the pathogenesis of systemic autoimmune disease. Arch. Dermatol. 133:767. Rasmussen, H. B.. 1997. Interactions between exogenous and endogenous retroviruses. J. Biomed Sci. 4:1. Rasmussen, H. B., J. Clausen. 1997. Possible involvement of endogenous retroviruses in the development of autoimmune disorders, especially multiple sclerosis. Acta Neurol. Scand. Suppl. 169:32. Jolicoeur, P.. 2001. Pathogenesis of defective retroviruses. Dev. Biol. (Basel) 106:201. Kubo, Y., Y. Nakagawa, K. Kakimi, H. Matsui, K. Higo, L. Wang, H. Kobayashi, T. Hirama, A. Ishimoto. 1994. Molecular cloning and characterization of a murine AIDS virus-related endogenous transcript expressed in C57BL/6 mice. J. Gen. Virol. 75:881. Kubo, Y., K. Kakimi, K. Higo, H. Kobayashi, T. Ono, Y. Iwama, K. Kuribayashi, H. Hiai, A. Adachi, A. Ishimoto. 1996. Possible origin of murine AIDS (MAIDS) virus: conversion of an endogenous retroviral p12gag sequence to a MAIDS-inducing sequence by frameshift mutations. J. Virol. 70:6405. Saoudi, A., B. Seddon, V. Heath, D. Fowell, D. Mason. 1996. The physiological role of regulatory T cells in the prevention of autoimmunity: the function of the thymus in the generation of the regulatory T cell subset. Immunol. Rev. 149:195. McGuirk, P., K. Mills. 2002. Pathogen-specific regulatory T cells provoke a shift in the Th1/Th2 paradigm in immunity to infectious diseases. Trends Immunol. 23:450. Stephens, L. A., D. Mason. 2000. CD25 is a marker for CD4+ thymocytes that prevent autoimmune diabetes in rats, but peripheral T cells with this function are found in both CD25+ and CD25− subpopulations. J. Immunol. 165:3105. Salomon, B., D. J. Lenschow, L. Rhee, N. Ashourian, B. Singh, A. Sharpe, J. A. Bluestone. 2000. B7/CD28 costimulation is essential for the homeostasis of the CD4+CD25+ immunoregulatory T cells that control autoimmune diabetes. Immunity 12:431. Yoshida, K., H. Kikutani. 2000. Genetic and immunological basis of autoimmune diabetes in the NOD mouse. Rev. Immunogenet. 2:140. Powrie, F., M. W. Leach, S. Mauze, S. Menon, L. B. Caddle, R. L. Coffman. 1994. Inhibition of Th1 responses prevents inflammatory bowel disease in scid mice reconstituted with CD45RBhiCD4+ T cells. Immunity 1:553. Powrie, F., R. Correa-Oliveira, S. Mauze, R. L. Coffman. 1994. Regulatory interactions between CD45RBhigh and CD45RBlowCD4+ T cells are important for the balance between protective and pathogenic cell-mediated immunity. J. Exp. Med. 179:589. Shevach, E. M., R. S. McHugh, C. A. Piccirillo, A. M. Thornton. 2001. Control of T-cell activation by CD4+CD25+ suppressor T cells. Immunol. Rev. 182:58. Suri-Payer, E., A. Z. Amar, A. M. Thornton, E. M. Shevach. 1998. CD4+CD25+ T cells inhibit both the induction and effector function of autoreactive T cells and represent a unique lineage of immunoregulatory cells. J. Immunol. 160:1212. Suri-Payer, E., A. Z. Amar, R. McHugh, K. Natarajan, D. H. Margulies, E. M. Shevach. 1999. Post-thymectomy autoimmune gastritis: fine specificity and pathogenicity of anti-H/K ATPase-reactive T cells. Eur. J. Immunol. 29:669. Suri-Payer, E., H. Cantor. 2001. Differential cytokine requirements for regulation of autoimmune gastritis and colitis by CD4+CD25+ T cells. J. Autoimmun. 16:115. Sakaguchi, S., N. Sakaguchi, J. Shimizu, S. Yamazaki, T. Sakihama, M. Itoh, Y. Kuniyasu, T. Nomura, M. Toda, T. Takahashi. 2001. Immunologic tolerance maintained by CD25+CD4+ regulatory T cells: their common role in controlling autoimmunity, tumor immunity, and transplantation tolerance. Immunol. Rev. 182:18. Sutmuller, R. P. M., L. M. van Dulvenvoorde, A. van Elsas, T. N. M. Schumacher, M. E. Wildenberg, J. P. Allison, R. E. M. Toes, R. Offringa, C. J. M. Melief. 2001. Synergism of cytotoxic T lymphocyte-associated antigen 4 blockade and depletion of CD25+ regulatory T cells in antitumor therapy reveals alternative pathways for suppression of autoreactive cytotoxic T lymphocyte responses. J. Exp. Med. 194:823. Onizuka, S., I. Tawara, J. Shimizu, S. Sakaguchi, T. Fujita, E. Nakayama. 1999. Tumor rejection by in vivo administration of anti-CD25 (interleukin-2 receptor α) monoclonal antibody. Cancer Res. 59:3128. MacDonald, A. J., M. Duffy, M. T. Brady, S. McKiernan, W. Hall, J. Hegarty, M. Curry, K. H. Mills. 2002. CD4 T helper type 1 and regulatory T cells induced against the same epitopes on the core protein in hepatitis C virus-infected persons. J. Infect. Dis. 185:720. McGuirk, P., C. McCann, K. H. Mills. 2002. Pathogen-specific T regulatory 1 cells induced in the respiratory tract by a bacterial molecule that stimulates interleukin 10 production by dendritic cells: a novel strategy for evasion of protective T helper type 1 responses by Bordetella pertussis. J. Exp. Med. 195:221. Akbari, O., G. J. Freeman, E. H. Meyer, E. A. Greenfield, T. T. Chang, A. H. Sharpe, G. Berry, R. H. DeKruyff, D. T. Umetsu. 2002. Antigen-specific regulatory T cells develop via the ICOS-ICOS-ligand pathway and inhibit allergen-induced airway hyperreactivity. Nat. Med. 8:1024. Zuany-Amorim, C., E. Sawicka, C. Manlius, A. Le Moine, L. R. Brunet, D. M. Kemeny, G. Bowen, G. Rook, C. Walker. 2002. Suppression of airway eosinophilia by killed Mycobacterium vaccae-induced allergen-specific regulatory T-cells. Nat. Med. 8:625. Geijtenbeek, T. B., S. J. Van Vliet, E. A. Koppel, M. Sanchez-Hernandez, C. M. Vandenbroucke-Grauls, B. Appelmelk, Y. Van Kooyk. 2003. Mycobacteria target DC-SIGN to suppress dendritic cell function. J. Exp. Med. 197:7. Iwashiro, M., R. J. Messer, K. E. Peterson, I. M. Stromnes, T. Sugie, K. J. Hasenkrug. 2001. Immunosuppression by CD4+ regulatory T cells induced by chronic retroviral infection. Proc. Natl. Acad. Sci. USA 98:9226. Hori, S., T. Nomura, S. Sakaguchi. 2003. Control of regulatory T cell development by the transcription factor foxp3. Science 299:1057. Powrie, F., K. J. Maloy. 2003. Immunology: regulating the regulators. Science 299:1030. Pasare, C., R. Medzhitov. 2003. Toll pathway-dependent blockade of CD4+CD25+ T cell-mediated suppression by dendritic cells. Science 299:1033. Bosio, E., C. L. Cluning, M. W. Beilharz. 2001. Low-dose orally administered type I interferon reduces splenic B cell numbers in mice. J. Interferon Cytokine Res. 21:721. Ogata, N., N. K. Day, R. D. Buell, R. A. Good, W. G. Bradley. 1993. Detection of the MAIDS virus using the polymerase chain reaction. PCR Methods Applications 2:272. North, R. J., M. Awwad. 1990. Elimination of cycling CD4+ suppressor T cells with an anti-mitotic drug releases non-cycling CD8+ T cells to cause regression of an advanced lymphoma. Immunology 71:90. Hartley, J. W., T. N. Fredrickson, R. A. Yetter, M. Makino, H. C. d. Morse. 1989. Retrovirus-induced murine acquired immunodeficiency syndrome: natural history of infection and differing susceptibility of inbred mouse strains. J. Virol. 63:1223. Holmes, K. L., H. C. d. Morse, M. Makino, R. R. Hardy, K. Hayakawa. 1990. A unique subset of normal murine CD4+ T cells lacking Thy-1 is expanded in a murine retrovirus-induced immunodeficiency syndrome, MAIDS. Eur. J. Immunol. 20:2783. Klinman, D. M., H. C. d. Morse. 1989. Characteristics of B cell proliferation and activation in murine AIDS. J. Immunol. 142:1144. Donaldson, L. A., R. Cheng, S. M. Savage, M. L. Sopori. 1994. Characteristics of CD4+ T cells which transfer murine AIDS (MAIDS). Cell. Immunol. 156:468. Numata, F., Y. Hitoshi, S. Uehara, K. Takatsu. 1997. The xid mutation plays an important role in delayed development of murine acquired immunodeficiency syndrome. Int. Immunol. 9:139. Yetter, R. A., R. M. Buller, J. S. Lee, K. L. Elkins, D. E. Mosier, T. N. Fredrickson, H. C. Morse. 1988. 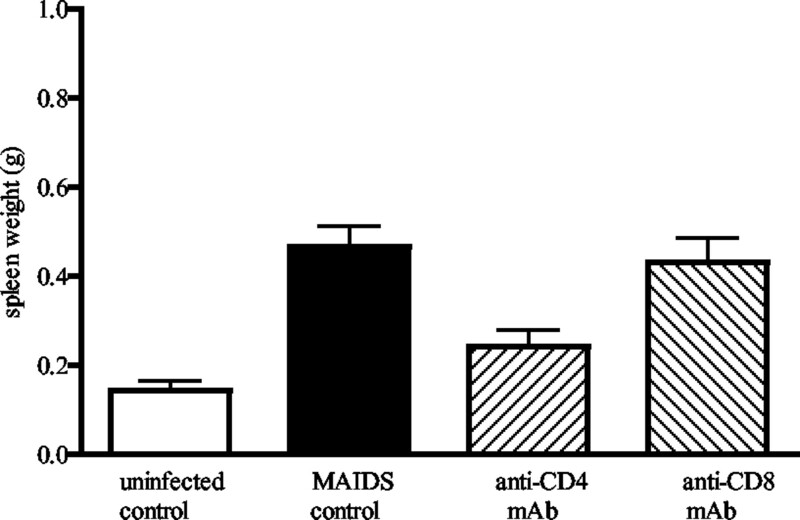 CD4+ T cells are required for development of a murine retrovirus-induced immunodeficiency syndrome (MAIDS). J. Exp. Med. 168:623. Takahashi, T., T. Tagami, S. Yamazaki, T. Uede, J. Shimizu, N. Sakaguchi, T. W. Mak, S. Sakaguchi. 2000. Immunologic self-tolerance maintained by CD25+CD4+ regulatory T cells constitutively expressing cytotoxic T lymphocyte-associated antigen 4. J. Exp. Med. 192:303.
de Leval, L., S. Colombi, S. Debrus, M. A. Demoitie, R. Greimers, P. Linsley, M. Moutschen, J. Boniver. 1998. CD28–B7 costimulatory blockade by CTLA4Ig delays the development of retrovirus-induced murine AIDS. J. Virol. 72:5285. De Leval, L., S. Debrus, P. Lane, J. Boniver, M. Moutschen. 1999. Mice transgenic for a soluble form of murine cytotoxic T lymphocyte antigen 4 are refractory to murine acquired immune deficiency syndrome development. Immunology 98:630.